As I type, Andrew Jordan is crossing the line at Brands Hatch to win round two of the Dunlop MSA British Touring Car Championship with Gordon Shedden and Colin Turkington behind him. 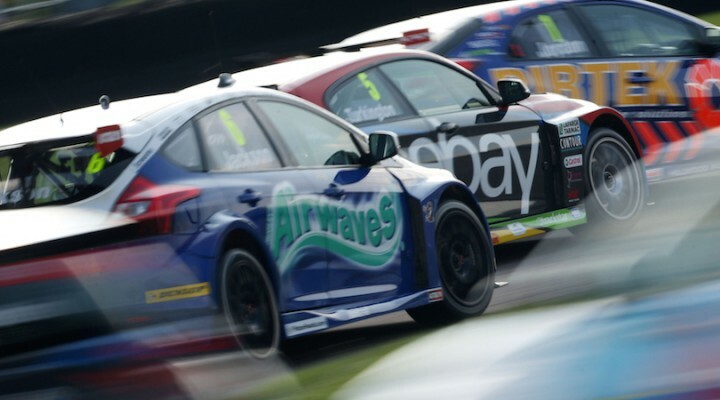 The afternoon soundtrack of BBC 6 Music has been replaced by the annual Duke Marketing BTCC Season Review (available now at all good stockists…) and it makes you realise how the season developed – and in some way the mind can play tricks – over 30 races. That opening weekend at Brands looked like an extension of 2013 didn’t it? Jordan pole, Jordan win, Jordan win again….so much for all the pre-season talk about seven champions: it was the reigning champion who was the man to beat. Remember, too, in the opening weekend how Colin Turkington suffered damage early on and, pace-affected, he dropped down the order. The cries of rear-wheel drive advantage were…. well, still to come. It’s inevitable that over 30 races fortunes will fluctuate and each weekend is like a mini-championship in itself. The one inescapable fact is that WSR as a team did a magnificent job. Early-season the team announced it had done a lot of work on the car over the winter, engine builder Neil Brown had found more grunt as well and then you add in a driver of the calibre of Colin Turkington. It was always going to be a formidable combination and Colin extracted the most from it. Was Turkington the driver of the year? Quite possibly, but there is a case to suggest that that mantle should be given to Jason Plato. I know I bang on about Plato being one of a small number of drivers who can make a car over-deliver, but he proved the point time after time this year. Had he not got involved in the opening lap skirmish at Thruxton and had the car go into limp home mode at the Brands opener, things could have been different but often the MG was higher up the order than perhaps it should have been. It’s a shame that the round 29 duel ended in contact – and the reaction from fans near the podium told a story – but history tells that JP was the only man who could keep the fight alive to the final weekend. Andrew Jordan’s season had its blip in qualifying at Oulton Park which condemned him to mid-grid and at a narrow venue, progress was hard. Worse was to come at Snetterton of course, and then being wiped out by a backwards Gordon Shedden at Knockhill hardly helped. And when he needed good results, the Hondas were struggling, which makes his third place at Rockingham in race three even more impressive: he was fending off Turkington who was on the faster tyres. The Civic Tourer had a mixed season, both Gordon Shedden and Matt Neal citing boost – or the lack of it – as a key problem, but the cars were on the money straight out of the box. “We will win races,” said Sheds after Brands Indy – and we didn’t have to wait long. That last lap, last corner gravel dash at Donington proved the point, as did race two at Thruxton, plus Matt Neal’s overdue success in Scotland, but the cars had a barren patch until Brands at the end of the season. Shedden again won the last race of the year in awful weather and whilst it is tempting to dub him the Rainmaster, it is also fair to mark him down as one of the best racers in the championship. He is another who never gives up and he pulled some stonking moves this season: trouble was, many were overlooked when he wasn’t in the lead scrap. There is another title in Shedden, make no mistake. So who else starred? Mat Jackson and Airwaves Racing were back where they should have been and Mat proved that he hadn’t forgotten how to drive with his wins at Knockhill and Silverstone, but then threw a big blob of ink all over his copybook with a spin while leading at Brands in October. Airwaves leaves of course, but let us hope that Jackson stays with David Bartrum’s team – collectively, they turned it round from 2013. Aron Smith drove impressively to his two wins – yes, I know they were reverse grid, but sponge-like he soaked up all the pressure and remember Oulton was run in the wet so he had more than just a charging Shedden to worry about. Smith is becoming one of the stars of the grid – the wildness is all but gone and the speed is increasing, so it is small wonder then that team owner Warren Scott wanted his signature early. A cheer is due at this point for Scott’s team as well: from struggling at the rear of the grid (indeed sometimes failing to be on it) in 2013, the team was transformed in 2014 and to win before mid-season was mighty impressive. Top job, all. The Mercedes A-Class of Adam Morgan delivered at the end of the season having knocked on the door all year. It’s a shame the win wasn’t a true one – as in taking the flag first – but by being the first Mercedes winner since Chris McLaren in 1962, Morgan gave us a record 11 winners in a single season and there are more Mercs set to join the grid next year. Others that deserve credit include Rob Collard who bounced back from his huge Silverstone smash to race strongly at Brands Hatch; Rob Austin who pulled another win out of the bag at Rockingham; Dave Newsham who delivered AmD Tuning.com its best overall result at Knockhill just 48 hours after the death of his mother. Shaun Hollamby’s team celebrated like it was a win and quite right, too. Newsham’s racecraft, honed in Legends, deservedly gave him the Jack Sears Trophy. Last year’s JST winner, Lea Wood, did remarkable things on a budget of nine quid and a banana and his Rockingham smash could so easily have spelt the end of the season. Credit to car builder Dave Longhurst that Lea finished the year, but it was tough on a tight purse. And best newcomer? So much for my prediction that Marc Hynes would star…he found touring cars a real handful and struggled for much of the year, so step forward Tom Ingram who was low on luck but illustrated his potential every weekend. If there is any justice, there will be teams with contracts in hand knocking on his door. And already we hear of new drivers coming in for 2015, new teams and a new brand in Infiniti. If you thought the start of 2014 was eagerly awaited, just wait for March 2015! Incidentally, the season DVD is up to Donington where Tom Ingram has just got ahead of Marc Hynes. And Plato has just won round four of the championship… There is some brilliant racing you know. You really ought to get a copy!